We are starting to explore the North side of the holy hill. 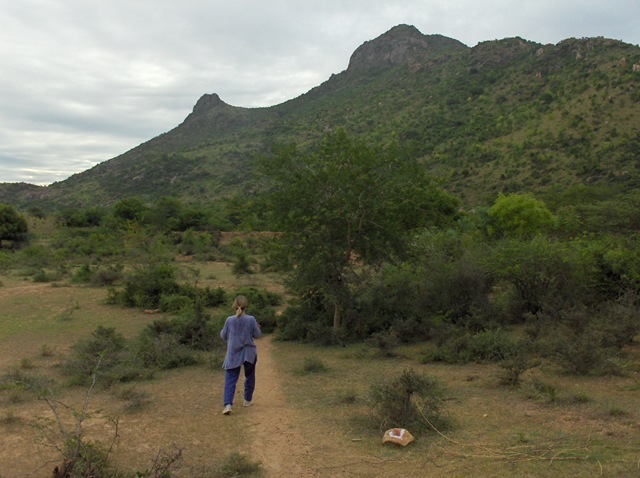 One thing we look for is an ‘Inner Inner Path’ that is closer to the base of Arunachala. 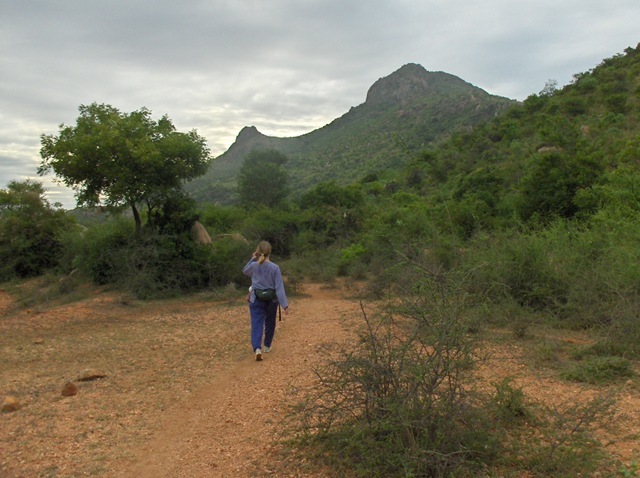 On all sides of Arunachala there are many paths, foot trails and animal paths. 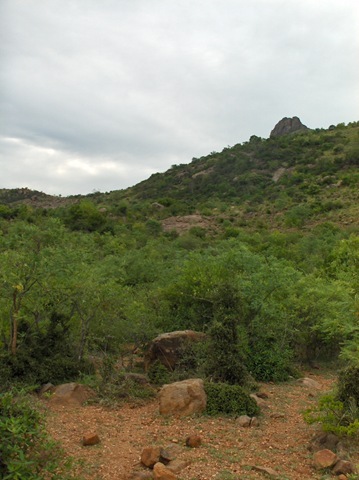 We have been gradually exploring the mountain, using what we can find from these paths. 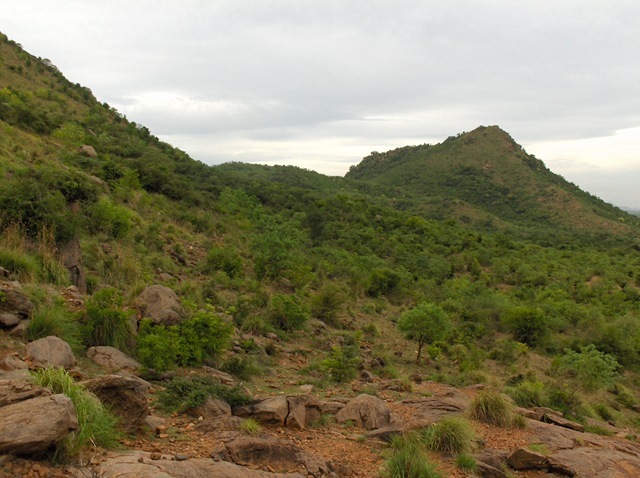 and started exploring the area between what we call ‘the Basin’ and the hill. 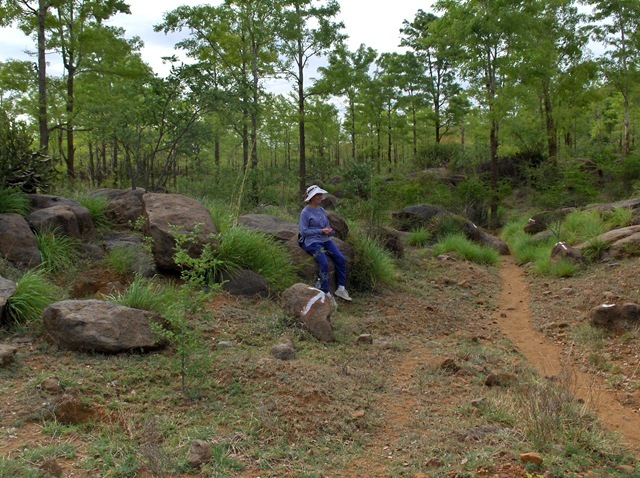 We found a bit of what could be the ‘Inner Inner Path,’ and started round the mountain. 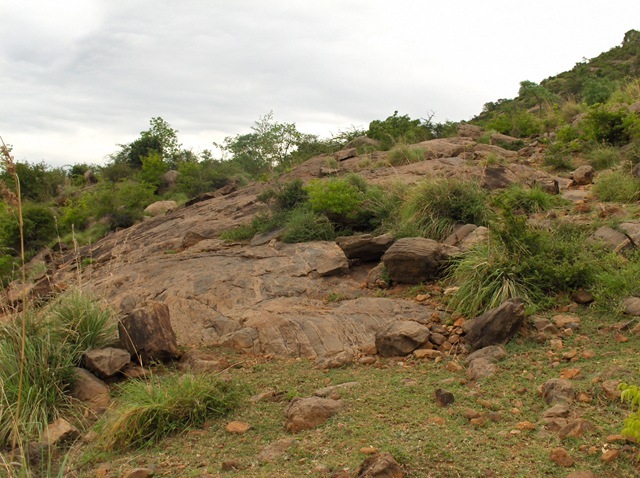 Soon we found a big rock formation that climbed up the base of the hill. 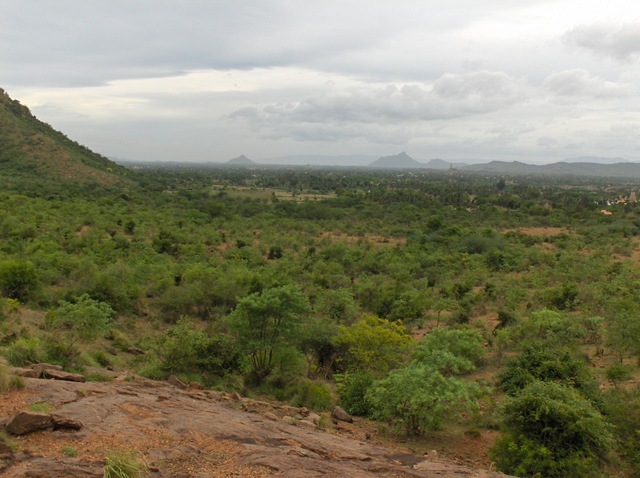 We went up this rock and found a wonderful view of the area North of Arunachala and Adi Anamalai. 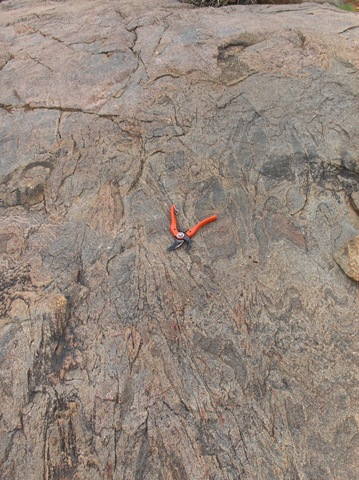 When we left, my new pruning clippers remained behind, on the rock where I placed them when I sat down to rest. Today we went back to see if the clippers were still there – and with our camera. Here are some photos we took ‘Under the loving gaze of The Elephant. 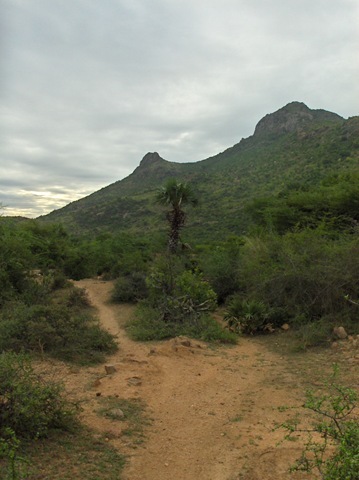 The Elephant is the move visible structure on the North side of Arunachala. 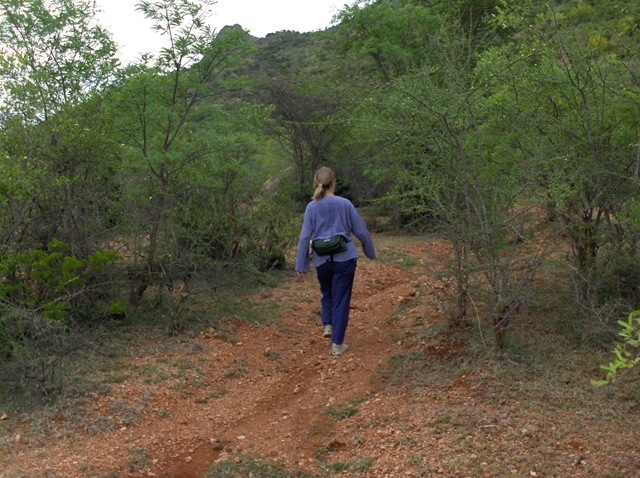 My wife, Carol, is walking ahead, with The Elephant on the mountain in the background. You can see the head and trunk on the hill. At the end of Parvati there is a small tank we call ‘The Frog Pond.’ There is usually water and frogs in it. I dried out towards the end of May. Since then rains have filled it again, but I don’t see the frogs yet. Approaching the Frog Pond, you may notice a small palm. I use this as a land mark, since I can see it from up the trail before we arrive at the Frog Pond. The Frog Pond is a place where often people walking the Inner Path will sit a rest a bit. Notice stone steps on the other side of the photo below. There are a couple of sets of steps. We usually sit on the steps at the South end of the pond. There is shade there in the mornings when we pass by. We will sit a bit, drink some water, and maybe read a few verses from ‘The Song of Ribhu’ before proceeding on our walk. 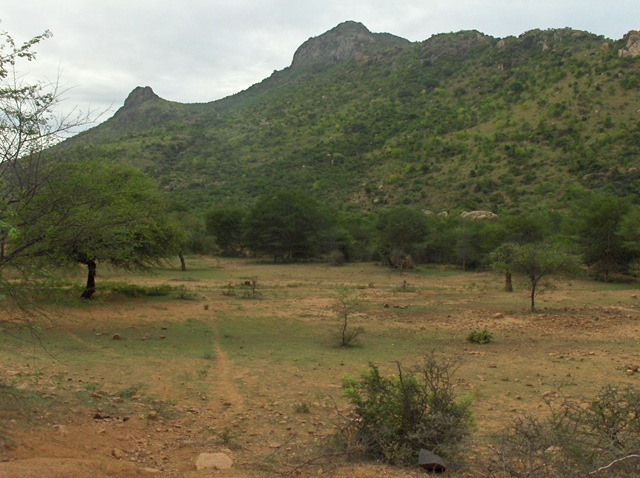 Today we would head to ‘the Basin’ and cross it to find the same set of paths we used earlier in the week. We are heading out from the Frog Pond. 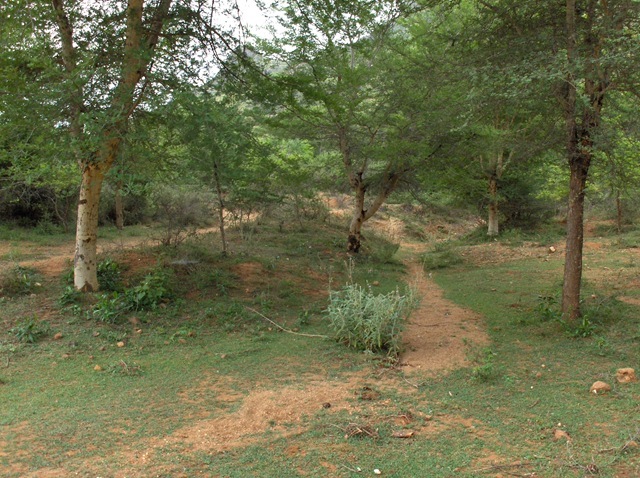 If you look closely you can see an earthen berm, with trees growing from it. This is what collects water in the basin. Sometimes this is filled with water. 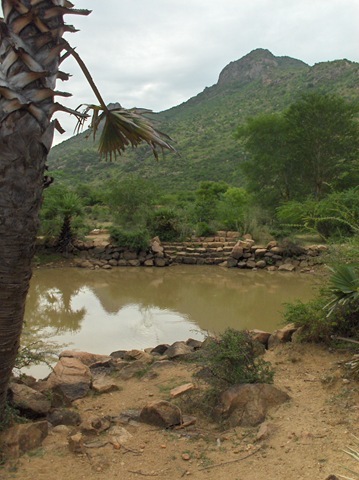 In this dry season there is just a small pond, to the left of this photo. We are going to the trees on the right of the photo aboive. That is one place where the path was easy to find. Below is the path, we took the second, higher path. There are many places to explore here. There are several big rocks that push through the trees. These interest me. I know that there will be great places to meditate at some of them. And started to see the rock structure on the mountain. 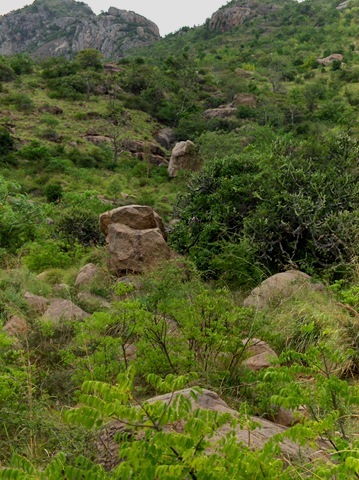 IN the photo below you can see a grey path of rock in the center of the photo. This is the rock. At the base of the rock. 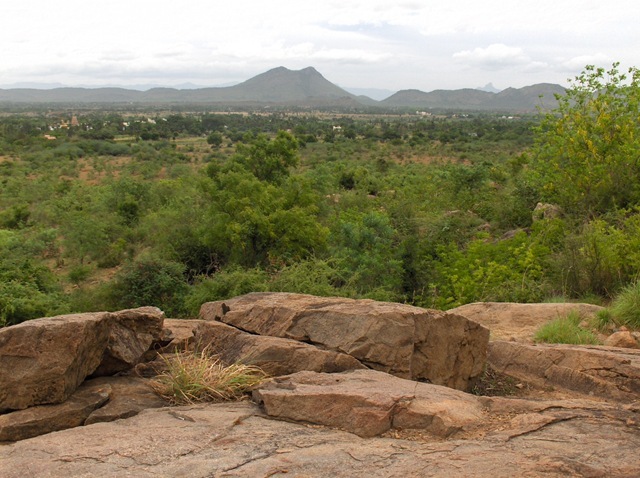 the rock is maybe 10 – 20 meters high, certainly high enough to get a grand view of the surrounding area. And at the top of the rock, there were my pruning clippers, still there two days later. Looking North. Note Adi Anamalai to the left in the photo. Today we did not explore more. We just headed back to the Inner Path to finish the mornings walk. After the path section I call ‘The Elephant’ is another section where maybe 20 years ago many trees were planted in rows on both sides of the Inner Path. I call this section ‘The Trees.’ IN this section there is a picturesque area with big rocks. Here is a photo of Carol sitting here. Tired today . 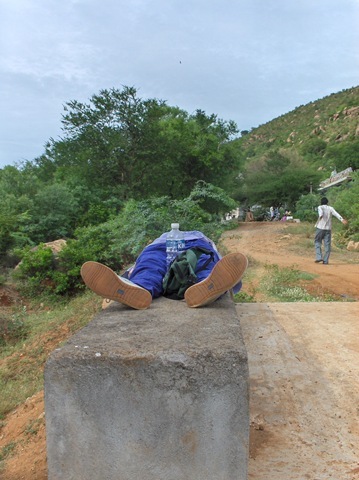 Further on the trail, near Panchamuka Shrine, Carol and I were very tired. Carol rested a bit before going on. Here she is in a yoga position, Savasana. 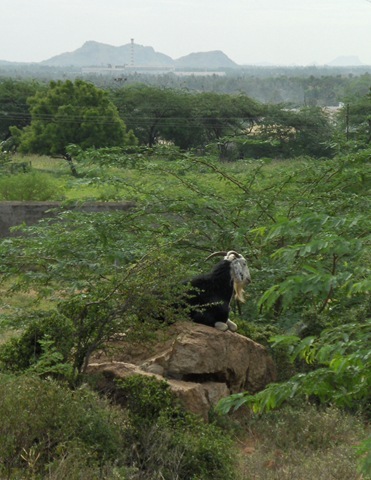 As we walked on the road down the hill from the Shrine, there was a goat again, sitting on a rock. From here we walked to the RamaKrishna Hotel and had breakfast of dosas and vadas, and Indian Milk Coffee. 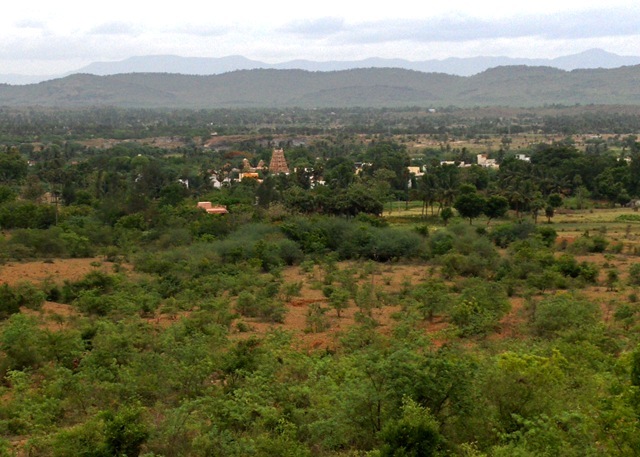 Then we called Rajan, our auto-rickshaw driver for a ride the rest of the way around the hill, and back home.